Welcome to the L G Design e-mail Marketing Page. 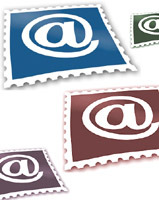 Learn more about our e-mail services and sign up for our e-mail newsletter here. LG Design has experience in all aspects of e-mail marketing. We can create an e-mail newsletter, promotion, event invitation, or survey for your company. Building and managing a list of your e-mail marketing contacts is another service we offer. The box to the right is a sign up form to capture e-mail addresses. Those signing up want to and people can opt out at any time. This box sends the e-mail address to a secure list controlled only by who you decide. This list also keeps track of when people opt out so you know when and maybe why they left your list. The site owner can add e-mails to the list the same way. These services are all available from LG Design. We are a business partner with Constant Contact an e-mail marketing specialty company. As a business partner of Constant Contact we offer all e-mail services and can help you start your own e-mail marketing plans for your company. If you have computer and some limited graphics experience you can set up a free trial account at Constant Contact. Click HERE to jump to the Constant Contact signup page. We can help you get started or design and implement an entire e-mail marketing campaign for you. Contact us today! When we create an e-mail campaign for your company, we have access to over 400 customizable designs. We can also create a totally new design; perhaps to match your website. There are almost unlimited choices all to make your e-mail stand out from the rest. A key component of this is having the mail reach the intended recipient. No one wants their e-mail marked as spam or just deleted as "another e-mail I don't want to see". Our e-mails are all sent using your contact list which has recipients that want the e-mails. Build trust and confidence by having legitimate unsubscribe and "forward to a friend" options readily available. Manage the list by checking for results and who received and who un subscribed to the list. We put a "join my list" or "subscribe to our newsletter" form on your website. (See top of column.) That way you can generate more interested parties to send the various e-mail to. Please contact us for more information; we can help your company and sales grow!